I’ve always liked Rite in the Rain notebooks. While I’m not particularly outdoorsy (I prefer to be called an indoorsman,, like most good bloggers), I love the durability of their paper and the retro aesthetic of their yellow or tan products, and of course, the gorgeous script typeface in their logo. That’s why I was excited that they introduced a series of mechanical pencils! I’ve always found it a little bit ironic that they have a wooden pencil in their logo, but had no graphite options in the writing equipment they sell. But still, this pencil is gorgeous, and fits with their market really well. It’s the same yellow, but in a smooth sturdy plastic, and a slate grey eraser. Like their notebooks, they’re inexpensive, but well made. And, I imagine, very durable. This pencil comes in three varieties — a yellow barrel with black lead, a black barrel with black lead, and a red barrel with red lead. This pencil was developed along with, and manufactured by Autopoint, which makes sense — it really fits within their wheelhouse. This was a good fit. I’m not a huge fan of how wide this core is — it’s 1.1 mm instead of the thin 0.5 or 0.7 mm that is often found in mechanical pencils. I can appreciate why it’s wider, though — it’s less prone to breakage, and shows up darker if writing bigger. Sure enough, it didn’t snap once when I was testing it. The graphite was nice and smooth, and dark. Especially on the paper in this Rite in the Rain notebook, it glided across the page. The red core, on the other hand, was a fairly unpleasant experience — the pigment is way too light (as you can see in the image), and waxy to the point of feeling gummy. It dulled much faster than the graphite core did. The only other complaint I have about this pencil is the sturdiness of the twisty point. As I’m writing, it sometimes creaks in an alarming way, like I’m stressing the little contraption inside that advances the core when I twist it. Nothing seems to be affected or broken, though, so it may just be a natural result of having two pieces that fit together like that. I really like how it feels. It reminds me of a Bic Clic, and I hope they don’t take that as an insult. For the price, a Bic Clic is one of the most attractive, best engineered pens I can find. It’s shaped beautifully, performs consistently and admirably, and even though it’s plastic, it’s really high quality. I’ve never seen a flaw in one. This pencil feel much the same. It’s a little bit thicker than a Bic Clic’s widest segment, and it’s just a little bit longer than the Bic. It feels really nice in my hand, and I imagine if I was someone who had to scribble notes in the rain, it’d be great to hold onto. I think my favorite part of this pencil is the eraser. I don’t think I’ve seen one like it before — it’s grey, and I was expecting it to be very pumice-like and gritty. It’s not, though. It’s super-smooth, but really effective. It rubs off cleanly, almost like a vinyl eraser. Sure, I’d like to see Rite in the Rain introduce a wooden pencil. But honestly, it’s no big deal if they didn’t. They produce a great notebook, one that any pencil would work well with. They lent their philosophy to this mechanical pencil — a quality, durable tool for not a lot of money. I think it holds its own really well in their product lineup. You can buy these mechanical pencils for $10.95 each, and refills for the core and the eraser, on their website. And for that 6×9″ top-spiral-bound notepad I used to review it? It’s $9.95 available from their website. UPDATE: A few readers have written to me that that the Autopoint All-American Jumbos are identical and cheaper. I don’t know if they are identical, and the RiR pencils are merely privately labeled, or if there are manufacturing differences/improvements. I intend to get an Autopoint-branded pencil and check it out. So in the meantime, I’d recommend that you hold off on your purchases of either. 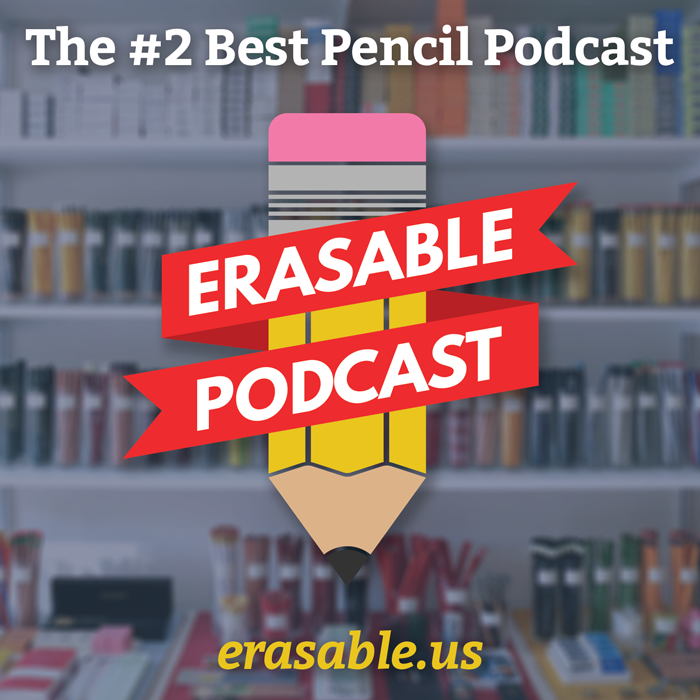 ← Get your Erasable stickers! Are these a new design by Autopoint for Rite in the Rain or are they just rebranded All-American Jumbos? The All-American Jumbo is half the cost on the Autopoint website. You can get it in different colors, including yellow. You are paying an extra five dollars just for the Rite in the Rain logo. The All-American Jumbo is a great pencil but you are right about that small design quirk at the tip; it can be a little annoying when it acts up. I also agree about the Bic Clic–a superb pen! I just noticed your photo of that back of the Rite in the Rain pad, with all the info on it in old-fashioned advertising rhetoric. This must be new, and it smacks of the kind of self-conscious irony that I hate on Field Notes. Rite in the Rain should be a serious tool, not self-referential or a “post-modern” retro gimmick. I hope they go back to plain yellow, tan, or green covers, unless they print info on it that is truly useful (measurements, etc.). Come to think of it, I don’t remember that stuff being on the other ones, either. When I get home I’ll check my other RiR notebooks in the collection and see if they have it. Andy, from looking at the photos carefully, I’d say the difference between the Rite in the Rain mechanical pencil and the All-American Jumbo is the shape of the barrel: the All-American is hexagonal, while the Rite in the Rain pencil seems to have a thicker, round barrel. Whether that translates to a major difference in writing performance I can’t say. A review offering a direct comparison might be interesting. And there might be other differences that I can’t tell from photos. You’re absolutely right! I am actually awaiting an Autopoint Jumbo right now! I’ll try to have something up next week.